Let’s face it, content is at the heart of every successful sale. Whether it’s blog posts and web content to attract customers through search, social media content and social advertising, or even the savvy email response to a customer looking for answers, without great content you’re dead in the water. But so many companies have a difficult time making this connection between publishing solid, useful, dependable or even entertaining content and closing sales. I’ve come up with my content strategy tips to help bridge that gap. First, I need to map out the customer journey and the phases they go through on the path to the sale. You can think of this as a modern-day sales funnel. Each prospect starts in the “See” stage and if you’ve done everything right, they end up in the “Care” stage. There are many obstacles along the path for both your customers and for your operations. Only strong leadership and planning turns your efforts into strong results. 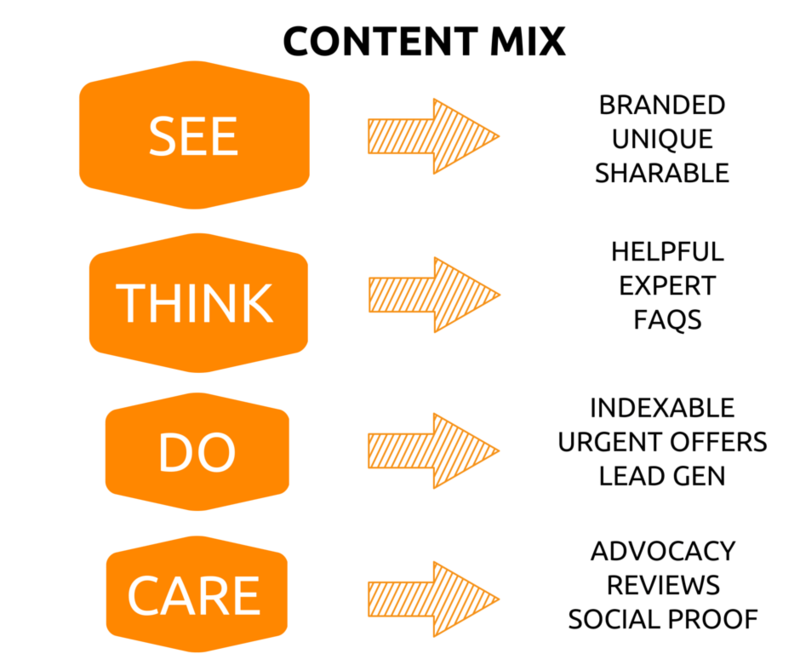 Content strategy tips for each phase of the buying cycle. Branded. Make sure you’ve completed a brand discovery so that you know exactly what your brand’s value proposition is and how that differentiates you from your competitors. Unique. Don’t share random, boring stuff that anyone else can share. Nobody remembers who gave them quality content unless it’s remarkable. Sharable. The best way to boost organic engagement is to publish stuff that people want to share. Helpful. People who are thinking they might need to purchase have lots of questions. Sometimes, they don’t even know what questions to ask. That’s where you come in. Expertise. Who doesn’t want to buy from a likable expert? Leverage your biggest content asset: your employees. Showcase employees as thought leaders and the company receives more recognition online. The company looks smarter because its employees look smarter. Indexable. Focus on the right balance of keywords, phrases and topics that your target customers search for. Urgent Offers. Factor urgency and scarcity into your content to get your customers to take action now. Lead Generation. Drive prospects to your landing page with savvy Facebook ads. Include a compelling call-to-action and lead form on your landing page to capture more leads and sales. Advocacy. People who’ve had a positive experience with your company are likely to recommend it to others. Include a specific content strategy to capture their stories through images and video. Reviews. It’s crucial to incorporate a process to capture your happy, loyal customers’ feedback. Leverage software tools to build a review funnel. Social Proof. Once we’ve had a positive experience during the buying process, we find ways organically to spread the good word. Devise a content strategy to illustrate how other buyers find you credible and trustworthy. Content is at the heart of every sale. Attract and engage today’s modern, hyper-connected buyers by integrating these proven content strategy tips within your own marketing plan. As always, I’m here to help guide you to get everything you need from content marketing to grow your business.